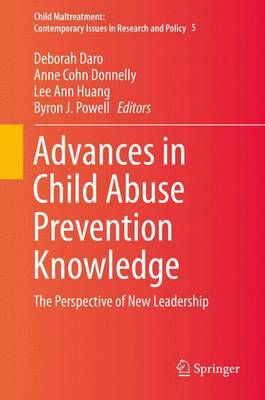 This book addresses new avenues in child abuse prevention research that will expand our capacity to protect children. These new avenues result from the emergence of new research methods made possible through technologic advances, an understanding of the benefits of cross-disciplinary research and learning and the entrance of many young scholars in the field. The book explores what these avenues produce in terms of clarifying the complex problems that continue to limit our progress in addressing child maltreatment and promoting optimal child development. Specifically, the book showcases individual contributions from emerging scholars and show how these scholars use the frameworks and advanced methods to shape their work, apply their findings and define their learning communities. The book highlights the benefits of creating explicit and extended opportunities for researchers to network across disciplines and areas of interest. The primary authors are young scholars from universities across the U.S. who have worked together as Fellows of the Doris Duke Fellowships for the Promotion of Child Well-Being - seeking innovations to prevent child abuse. Through this program, the Fellows have engaged in a robust self-generating learning network designed to create the type of ongoing professional linkages and decision-making style that fosters an interdisciplinary and team planning approach to research design and policy formation.